Bottled Water Vs Tap Water? Bottled water vs tap water, which is better? This is a legitimate question for the conscientious raw foodist who wants the benefits of clean, safe, healthy drinking water. People who adopt the concept of eating raw food do so for their health and wellness. Along with following a more healthy diet comes the question of clean, safe, healthy drinking water. You may be already aware of the benefits of drinking water daily whether or not you follow a raw food diet plan. Isn't Bottled Water the Best Water to Drink? As health-minded individuals, we only want the very best water to go with our raw food diet. To us, consumers of water, the producers of bottled water have promoted the idea in the debate of bottled water vs tap water, that bottled water is by far the clear winner. They have promoted that bottled water is superior in taste and cleanness to tap water. Bottled water is pricy when compared to plain tap water and the belief is, since you are paying more for something, you must be getting a better product. Many believe that bottled water is clearly the far healthier choice when it comes to drinking water. So what is the answer to the question of bottled water vs tap water? How "Good" Is Bottled Water? That is the question that the Environmental Working Group (EWG) asked. To answer this question, they surveyed the clear liquid in 173 different bottled water brands. Then they searched the company's website looking for a water quality report on the bottled liquid. If they could not find it on the website, then they called the company directly to ask for a water quality report. After all, if you are buying and drinking bottled water because it is far healthier, don't you think that you, as a consumer, should be entitled to a water quality report on the product you are paying for? The result? They used a report card grading and only three the of the 173 types of bottled water tested received a 'B'. Not one received an 'A'. The rest got 'C's', 'D's' and many got the failing grade of 'F'. Some of the questions that they asked was the source of the bottled water, were there any contaminants found in the water that was bottled and was the water purified in any way before bottling. 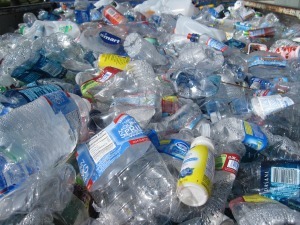 What exactly is in your bottled water remains a bit of a mystery. You don't know for sure. Some of the claims on the bottles of water are rather fictitious. In the great debate as to what is better: "bottled water vs tap water" I did not even touch the on the subject of environmental concerns with the abundance of plastic bottles choking landfills. That is HUGE. Then these is the concern of the possible cancer-causing toxins that leach out of the plastic when allowed to sit in the sunlight for extended periods of time. Do you really know where that cold bottle of water that you pull out of the convenience store's cooler had been? Before it was in the cooler, begging you to buy it, it may have been sitting in sunlight, getting hot, slowly but surely leaching chemicals into your water. If tap water is not healthy for you, at least it is far more honest as to its contents. Tap water is regularity tested and regulated. As a consumer you can easily find out what exactly is in your tap water. But with the knowledge that certain chemicals such as chlorine and added synthetic fluoride is in our tap water, do you really want to drink it, or let it soak into your seeds and nuts, and let your family ingest the chlorine and fluoride? Since you're now aware that bottled water is not necessarily pure or clean, perhaps you have considered the question: Should people drink distilled water? In the opinion of some, distilled water for drinking is the only pure, and even safe, water alternative. However, before investing in a home water distillation system, consider what that the pure, clean water may not be as good for you as you may have once believed. Distilled water may be a bit too pure for comfort. There is a reason why distilled water is called “hungry” water. As a human, you have a need for clean, safe, healthy drinking water. As a raw foodist, you use water not only to drink on a daily basis, but also as a base for soups, sprouting and soaking. Whatever food you use water with will be incorporated into your body. Obviously, you want the best for your body or you would not be interested in eating raw foods. So it naturally follows that you are searching for a source of clean, safe, healthy drinking water. If you are not clear as to bottled water vs tap water, the best water to drink may be that which you filter yourself. This conclusion is incidentally what the EWG came to after testing all of the 173 containers of bottled water. The only type of water that they would give an 'A' score to is not tap water, none of the bottled water (remember only 3 out of the 173 received a 'B') but rather home-filtered tap water. Despite all of the murkiness involving water, the clear choice for clean, safe, and healthy drinking water is to use your tap water, but invest in a water filtration system.